For Sarah Gibson, few memories will top the time she and her older sister, Stacy, marched alongside each other for the first time as members of The Ohio State University Marching Band two years ago. Family members in the stands watched with tears in their eyes as the sisters performed. For Ryan Dunson, leading the band out as an assistant squad leader of the snare drums is an experience he’ll never forget. 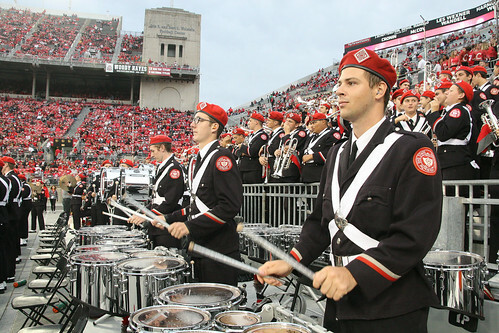 And for Joshua Aguilera, dressing up as “Wilbur Wolverine” and drawing boos from 100,000 Ohio State fans as Brutus’ opponent in a halftime skit remains atop his list of favorite band memories. But for these Fisher students, and the nearly two dozen others who are part of “The Best Damn Band in the Land,” the unique opportunity to perform as part of the 2018 Macy’s Thanksgiving Day parade may soon rival these and other band-related experiences. Fisher students Sarah Gibson (middle) and Alex Brown (right) practice prior to an Ohio State football game. The Ohio State University Marching Band was selected from more than 100 applicants as one of 12 high school and college bands to march in the 92nd edition of the annual holiday spectacle. Click on the photo to see more from The Ohio State University Marching Band. Dunson, a third-year logistics management student, said the performance will be a part of a busy week that is capped by the annual Ohio State-Michigan game just two days after the parade. Time management and prioritization are themes that have been key to Gibson’s success as an operations management student at Fisher. While she juggled her responsibilities as a first-year baritone player in the band, she joined the college’s Business Scholars program, which helped her establish a group of peers. Sarah Gibson and other Business Scholars on a recent trip to New York City. Fourth-year Accounting Honors student Patrick Wang has a slightly different perspective on the band’s upcoming trip to New York. Wang serves as part of the band’s support staff as a student uniform assistant. The staff manages the band’s instruments, uniforms and audio and visual recordings. Student staff members also work to acquire props for performances, food for game days and make sure the band runs smoothly. Photos courtesy of Crockett Photography.